Happy National Library Workers Day from all of us at FableVision! Here at the studio, we are acutely aware of the impact that libraries and the librarians who keep them running have on communities, access to literature and educational resources, and spaces for learning and creativity. 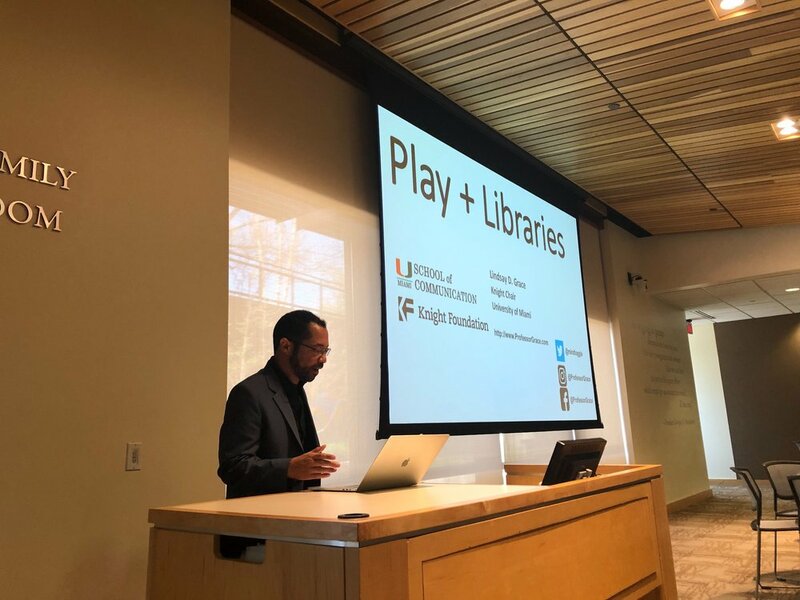 This is why FableVision was honored to co-host the inaugural Libraries, Games, and Play Conference on Saturday, April 6 at American University with the American University Game Lab. As longtime advocates of engaging students of all ages in their own learning through media and interactives, bringing educational technology and game-based learning tools and best practices into formal and informal learning spaces, such as libraries, is a topic very close to our hearts. In their opening remarks, J Collins asked attendees to enter into the conference space with a lens of inclusion and an awareness of who is not in the room. Not all librarians are able to leave their libraries, and the children who rely on them every day, to attend a conference. 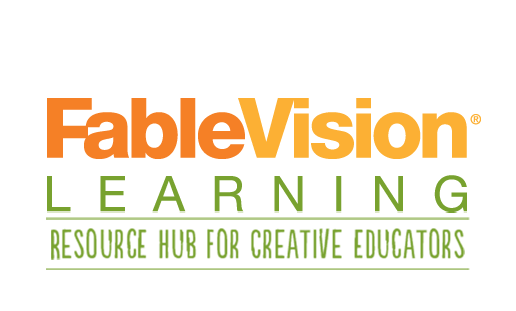 In the spirit of the inclusion, access, and network that is at the heart of every library, FableVision Studios has created a recap blog of the one-day conference for everyone who could not be there. From the opening keynote address and gaming workshops to FableVision Learning and the Reynolds Center for Teaching, Learning and Creativity’s showcase of the Fab@School Maker Studio and Paul Reynolds’ closing keynote, let’s dive in and see what the day held! Following the opening remarks, Lindsay Grace, Knight Chair of Interactive Media at the University of Miami and founder of the American University Game Lab, delivered the opening keynote. In his address, Grace recounted his own experience learning to code as a child using copies of Nibble Magazine he checked out from his local library. Libraries provided the access and the space for Grace to learn how to code, experiment with coding, and engage in his own learning through play. In his keynote, Grace brought out that play itself is an evolutionary necessity. When we think of popular games that children play, many of them teach evolutionary skills. “Tag,” for instance, is a game of hunter and hunted. “Simon Says” is a game that teaches impulse control. The two purposes of play, according to Grace, are practice and laboratory. Games, in particular, are structured play that give players safe spaces for practice and experimentation. Game design creates problems and offers solutions, which is why games and game-based activities are so important for learning spaces such as libraries. During the conference, the Reynolds Center and FableVision Learning showcased their innovative, STEAM-powered edtech product Fab@School Maker Studio. The Fab@School Maker Studio, an affordable and easy to implement digital design and fabrication software that introduces students to 2D and 3D printing and model creation, was a big hit with the public and private librarians at the conference. Schools, libraries, and programs from across the United States have already been using the research-based Fab@School Maker Studio to create practical and affordable makerspaces using paper, cardstock, and inexpensive digital fabricators. The software provides hands-on opportunities for students of all ages to get comfortable with easy, paper-based digital design and fabrication tools. FableVision Studios was also able to share more information on our portfolio of engaging media and interactives that educate, inspire, and move people to action. In particular, we shined a spotlight on CyberChase Fractions Quest and Project Here Games. CyberChase Fractions Quest is an immersive, story-based mobile game that engages 3rd and 4th grade students in fractions learning we created in partnership with THIRTEEN Productions LLC for WNET and the Education Development Center’s Center for Children and Technology (EDC/CCT). Project Here Games is a collection of games dedicated to ending substance abuse in teens that we designed and developed in partnership with Health Resources in Action, the GE Foundation, and the Massachusetts Attorney General Office. These projects, along with the various others in our portfolio, highlight the power of using games and other media to supplement traditional educational tools and engage students on a variety of topics. The day ended with a closing keynote address from FableVision and Reynolds Center co-founder and CEO Paul Reynolds. 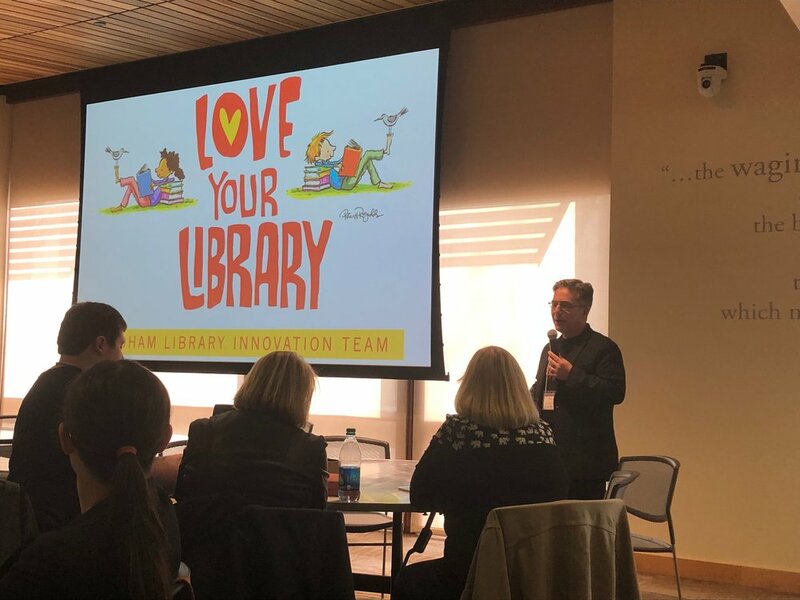 Paul began his talk by expressing his love for libraries and their role in inspiring the next generation of creative problem-solvers. Especially in this rapidly emerging age of technological and climate shifts, libraries are becoming more relevant as they embrace change and offer exciting new portals into playful learning. Libraries not only foster learning through gameplay and making games, but they are also the key to growing the creative human potential the world needs. In a punitive and assessment-focused culture where many students are afraid to do things they don’t know in fear of getting marked down, creativity and playful learning are crucial to providing students with a safe space to learn, fail, and learn from their failures. Using personal accounts of teachers who encouraged him and his twin brother Peter H. Reynolds to create bravely, his own advocacy work with the Dedham Library Innovation Team and other schools and public libraries in the country, and digital tools FableVision and the Reynolds Center have developed to support storytelling and self-expression, Paul spotlighted and celebrated librarians and other creative educators who understand the critical mission of developing and protecting creativity. Following the keynote, Paul signed books sold by local independent bookstore Politics and Prose. FableVision would like to thank everyone involved in planning the Libraries, Games, and Play Conference. Thank you, as well, to all who attended. And for those who couldn’t, we hope to see you next year!